Covering the torso, this shirt is made up of thousands of interlocking metal rings. A chain shirt is the best kind of armor that a rogue can wear—it provides good protection, yet is still light enough to be quiet. This suit of interlocking metal rings covers your torso, legs, and arms. The suit includes gauntlets. 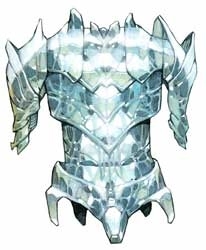 Chainmail is the best kind of armor that a cleric can wear—it provides good protection, but is a little bulky. This metal suit includes gauntlets, heavy leather boots, a visored helmet, and a thick layer of padding that is worn underneath the armor. Full plate is the best kind of nonmagical armor a character can get. Combining elements of full plate and chainmail, half-plate includes gauntlets and a helm. Many fighters switch to half-plate as soon as they can afford it, and switch to full plate once they have enough money. You strap a heavy shield to your forearm and grip it with your hand. A heavy shield is so heavy that you can’t use your shield hand for anything else—you can’t carry anything with that hand and can’t use two-handed weapons. This armor is made of thick furs and animal hides. It is bulky, but inexpensive. Depending on where you get it, it might be bear skin, rhino hide, giant lizard, or something stranger. Primitive warriors and clerics often wear this. Leather armor is made up of pieces of boiled leather carefully sewn together. Most rogues prefer studded leather for better protection. In poor settlements or hot lands, the town guard may wear leather armor instead of metal armor. You strap a light shield to your forearm and grip it with your hand. A light shield’s weight lets you carry other items in that hand (like a torch or a lantern), although you can’t use a weapon with that hand. Scale mail is made up of dozens of small overlapping metal plates. The suit includes gauntlets. It is much cheaper than chainmail and gives almost the same protection, so many new adventurers wear scale mail. Splint mail is made up of metal strips sewn to a hard leather undercoat. The suit includes gauntlets. Splint is the cheapest heavy armor you can get. Some fighters save money by wearing splint mail instead of half-plate. Similar to leather armor, this suit is reinforced with small metal studs. It is much cheaper than a chain shirt, so most rogues start with a suit of studded leather, then upgrade to a chain shirt when they can afford it.